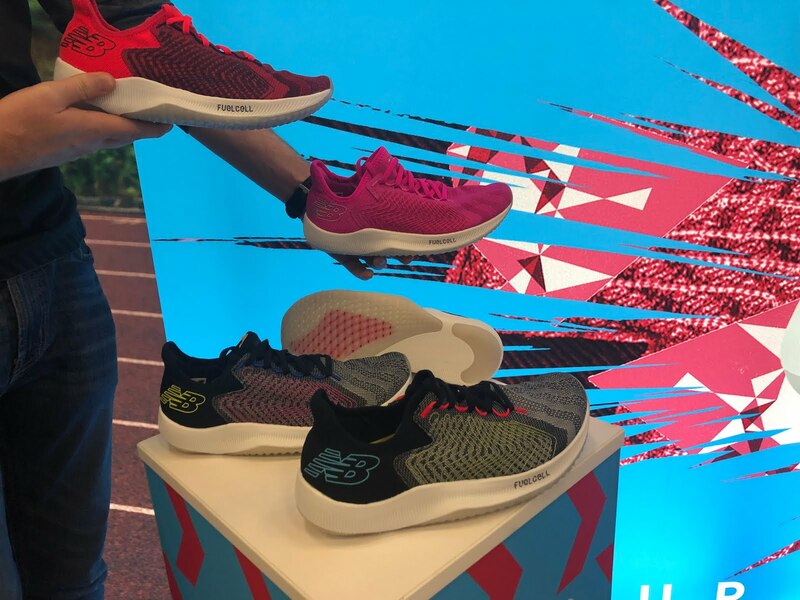 New Balance was on a roll at The Running Event with two new run shoes, a speed oriented trainer the Fuel Cell Rebel and their first max cushion trainer the Fresh Foam More. 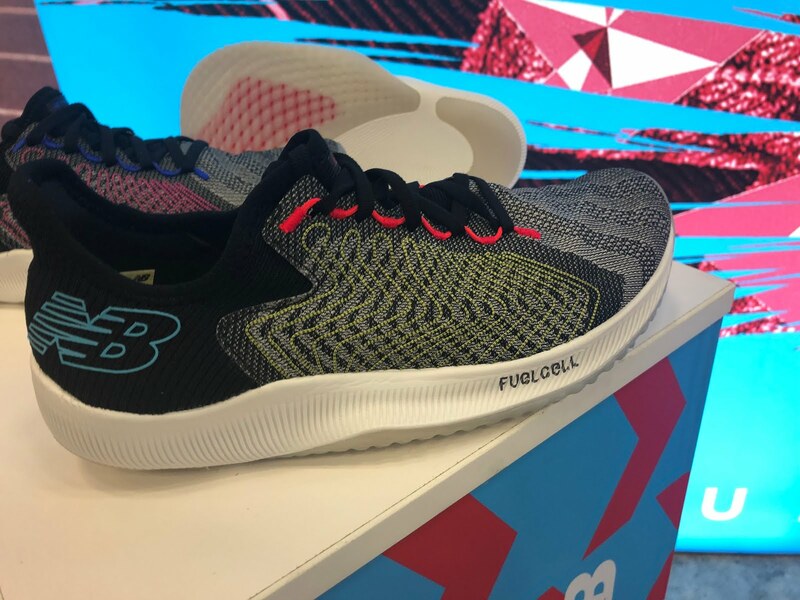 Not left out we also saw a strong upper update to their popular Fresh Foam Beacon. The 7.3 oz / 208 g Rebel has a 6mm drop and will be available August 2019. 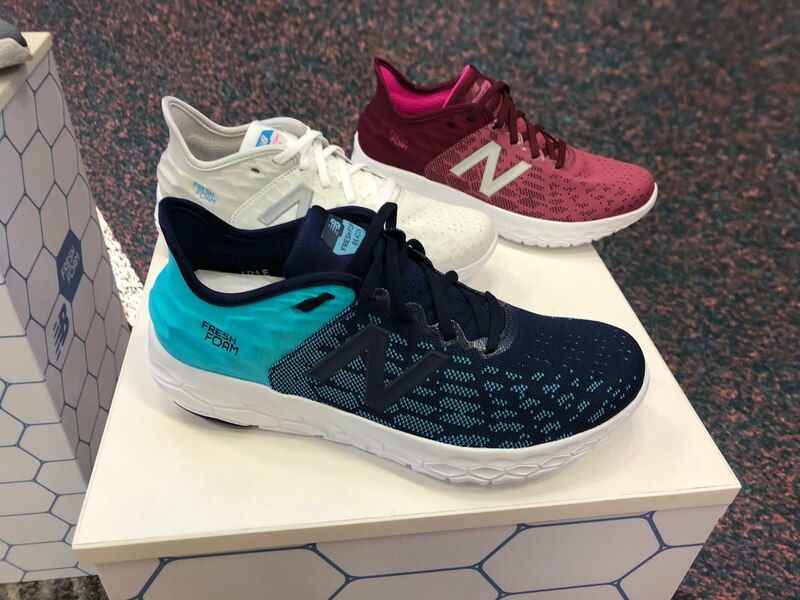 It is a speed focused shoe designed with assistance from New Balance athlete Jenny Simpson. It is clearly not designed for "easy" runs. ...and also a unique lateral mid foot fin which is said to provide a platform for a rapid pop and transition to toe off. We believe the midsole is a form of RevLite, as in the 1400, but will confirm. The engineered mesh upper has a bootie construction, deconstructed heel and woven in Trace Fiber cords (similar also seen in shoes from Hoka and Saucony this season) to provide support to the upper. 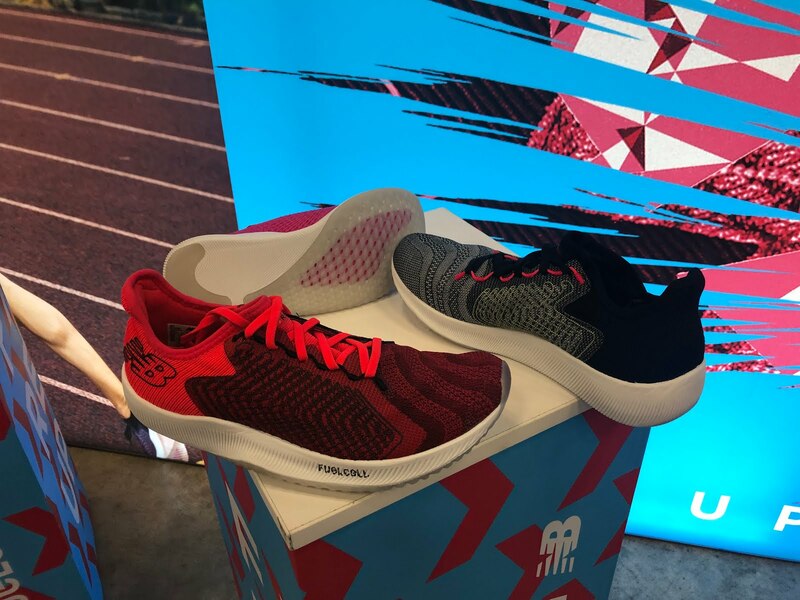 The new engineered uppers can get their support from denser mesh areas which can end up stiff and prevent a good foot wrap or overlays with glue and stitching which can add weight and make foot wrap less seamless. The Trace Fibers provide support while being all of a piece with the upper so a ir appears a good and secure wrap and hopefully weight savings. We can't wait to test this approach. The outsole is a crystal type translucent rubber. We hear the durability of crystal rubber also allows for thinner (weight reducing) yet long lasting outsoles and is not just an aesthetic trick. When New Balance presented the shoe to us in the video above they said the More has "more than enough cushion". It arrives April 2019. 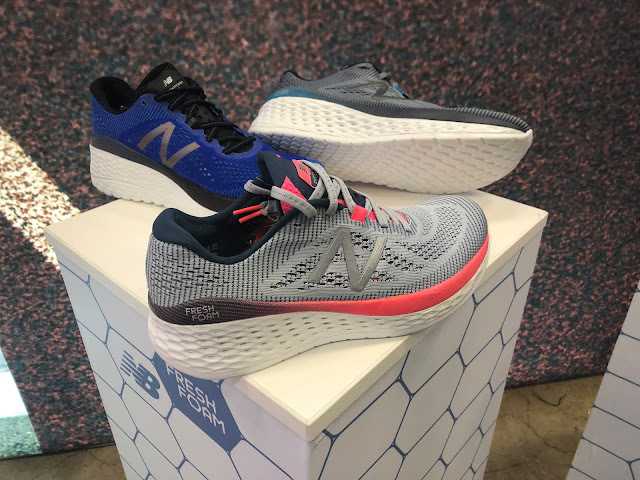 It will be NB's most cushioned shoe. More has a 4mm drop and will weigh in at 10.2 oz./ 289 grams. New Balance highlighted that special care was taken that the on the ground "nets" are sufficient for the More to be stable given the big stack. The Fresh Foam midsole is laser etched on the lateral side to deflect shock and thus provide softness. 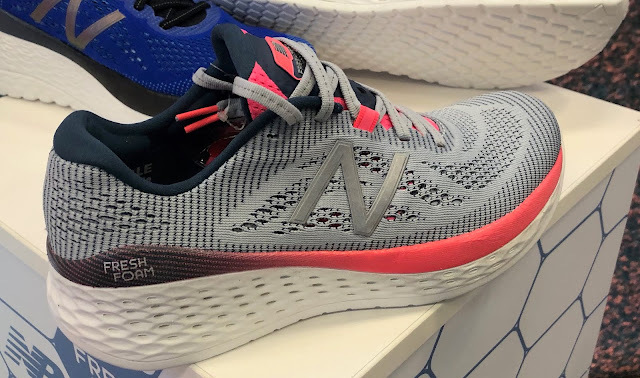 We found the laser etchings in the New Balance Fresh Foam 1080v9 do provide some additional softness and are not a gimmick. The upper is an engineered mesh with no-sew overlays. 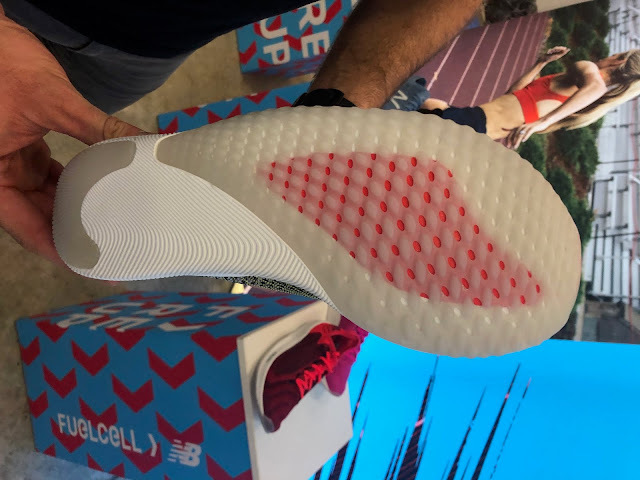 The outsole is more Fresh Foam this time Ground Contact Fresh Foam as in the Beacon, an outsole which has proved surprisingly durable. The shoe felt quite stiff so we hope a rocker geometry kicks in. The Beacon gets a new upper with a nice molded heel area with similarities to the excellent but low molded heel of the 1080v9. 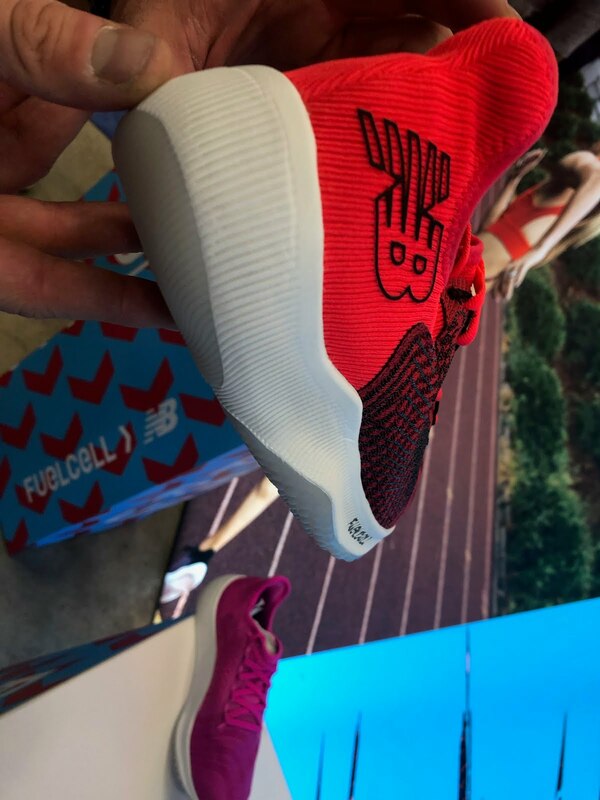 Here,and yes it follows the style of some others with the high swept back achilles tail, we think it will better lock down and stabilize the heel and is a great potential upgrade. No other changes were highlighted. We will update with price and availability but expect Summer 2019. 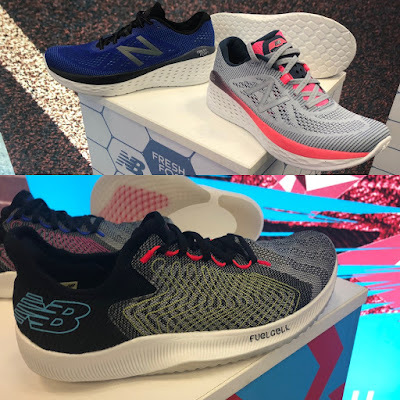 Man, is it a great time for runners with all these new, exciting shoes coming out since 2017ish. We're truly spoiled. I saw a YouTuber had posted about a new Zante (with a mid-cut ankle upper), as well. Yes Zante Solas. We will be reviewing it soon. Yes indeed spoiled. New midsole tech, new less overlay and pieced together uppers, lighter weights, more dynamic rides! 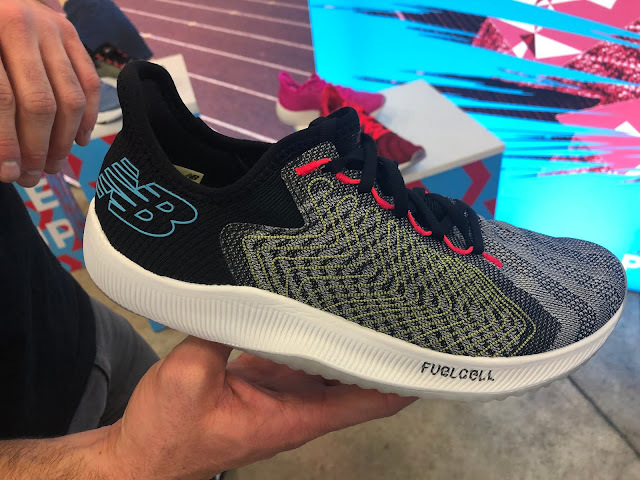 Another website is stating the Fuelcell Rebel won't have the "nitrogen infused" foam. Is the midsole going to be all Revlite? Hey Sam, as you stated you will review the Solas, will there also be a review of the Zante Pursuit? How long do we have to wait for the review(s) of the new Zante(s)? I'm really looking forward to test out the Pursuit! We are hoping to review both. We have ordered them but sometimes NB is tricky to work with as far as actually getting samples. Any idea of the stack on the Fuelcell Rebel. 6mm drop like the Beacon but less stack? The beacon is my go to shoe hope it doesn't end up with the same heel slippage issue as the 1090 V9.